TDK Corporation has started mass production of a new translucent passive matrix organic electroluminescent display with QVGA resolution. The UEL476 display is fabricated using thin-film technology with an organic material that emits light in response to an electric current. It features high brightness, a wide viewing angle and other characteristics that make it very easy on the eye. The short response time of organic electroluminescent technology makes it popular for use in flat panel displays. All of TDK’s organic electroluminescent displays are passive matrix types. 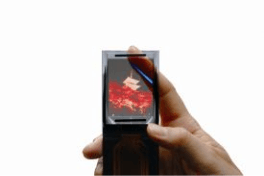 The newly developed translucent version is primarily intended to be used as the main display in mobile phones and other mobile devices. It has a display area of 36 x 47.9 mm with a resolution of 240 x 320 pixels (RGB), a transmittance of 40%, and brightness of 150 cd/m2. Although the new display is a translucent type, in order to protect the user’s privacy it is designed to make the contents difficult to view from the rear. The display uses colour filters to ensure that the red, green and blue pixels have the same service life and prevent colour shifts. Favourable temperature characteristics enable a wide operating temperature range from -20 to +85 ºC. Ongoing research at TDK focuses on expanding the product spectrum to include a variety of colour products, as well as further improving precision and increasing service life for all types. TDK started developing organic electroluminescent materials in 1991, establishing an in-house R&D infrastructure encompassing the entire process from molecular design to chemical composition and device evaluation. This led to the development of a proprietary long-life material and a thin film layer configuration, as well as an optimised mass production process. Development of a white organic electroluminescent module was started in 1995, culminating in a product in 2000.